Don’t drown your microfibers, clean and restore them with Pinnacle Micro Rejuvenator! Developed Specifically for Microfiber: Microfiber is different than any other fabric, which is why we recommend it for many detailing projects. In addition to over 200,000 strands per square inch, microfiber towels are soft and plush. They absorb water at a faster and deeper rate than regular towels. You may have already found that some microfiber towels still have stains after washing. Say goodbye to those stains with Pinnacle Micro Rejuvenator. We’ve used only the best ingredients, which allow Micro Rejuvenator to break down, suspend, and remove elements from microfiber towel fibers. Within this extraordinary, formula is a powerful degreaser which breaks down chemicals within the towel, extending its life. That is the rejuvenation. You will see your towels looking brighter and feeling softer with each wash. You can also use Micro Rejuvenator on cotton and chamois! Fresh Smell. I really love how freshly washed clothes smell. Like many, I have my signature scent that is basically my detergent of choice. Uncapping the Micro Rejuvenator bottle, is like stepping into a fresh spring meadow. The scent is clean and non- perfume, leaving your towels fresh, fluffy, and stain free. There are no harsh chemical odors! Scientific Breakthrough. Pinnacle Micro Rejuvenator really does work like no other formula, due to the specific blend of surfactants, emulsifiers, chelating agents and water softeners. Magnesium and calcium harden water, and over time our towels feel the brunt of that as they get stiff. Pinnacle Micro Rejuvenator rids towels of these hardeners, making the fibers more pliable and soft. Grease and oil residue build up on towels and can cause problems as well. Pinnacle Micro Rejuvenator will lift petroleum based stains, allowing for easy removal during the washing process. There are no bleaches or fabric softeners, which can cause microfibers to decay over time. Pinnacle Micro Rejuvenator is safe to use in high efficiency washers. A handy measuring cup is built right in. For a small load, add 1oz. (approximately 4-5 capfuls) to your wash. For a full load, add 2oz. (approximately 8-10 capfuls) to your wash. For heavily soiled items, add 1oz. to a 5 gallon bucket filled with water and let soak. Submerging your hands in treated water may cause them to become especially dry, but do not be concerned. This is a non-toxic formula and that effect is caused because this formula is so powerful. Like many Pinnacle products, the Micro Rejuvenator is biodegradable. Q: Can I use it on other fabrics? A: Absolutely! 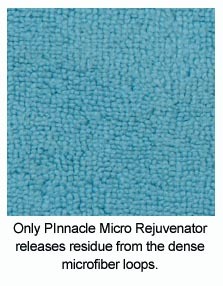 Pinnacle Micro Rejuvenator works wonders on cotton, chamois, and buffing pads. It will remove grease, oil, car wax and protein stains from all of these fabrics just as easily as it would work on microfiber. Q: What does the term “rejuvenator” actually mean as far as cleaning microfiber? A: Towels should come out of the dryer fluffy and clean, rejuvenated from a great washing. This quality of washing will extend the life of your towels, give them a pleasant scent, and most importantly, clean the fibers to allow for optimum detailing. Pinnacle Micro Rejuvenator does just that. You will see the difference in the first washing! Pinnacle Micro Rejuvenator 128 oz. Seems to work like a soap should. But specifically for microfiber. Not too good. Just ok. Seems to get the wax out of bonnets and such, but doesn't clean any dirty spots on anything. Washed twice first time. Second time I used twice the recommended amount. 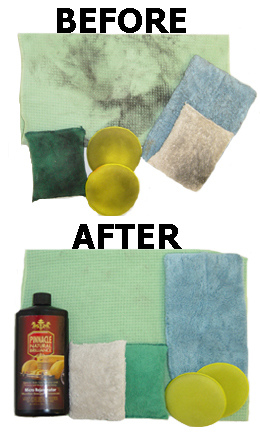 Wont clean pads with an armor all type product or a trim restorer product at all. Had to rewash with Tide. Not worth the money. ConsNot powerful enough to remove dirt in any manner. Expensive. I bought this to see how well the more expensive microfiber cleaner would do and I can say its not any better than the chemical guys stuff i been using. I can get a gallon of it for around $20. Wouldnt say its bad but its not worth the money in my opinion. This went on easily, with a good foam. Cleaned well and the smell is great. I'm impressed. ProsEasy to foam. Good wash.